Today I’m going on and on over at Zan’s blog about all the scary things parenthood could entail. Check it out, and then read her blog too, because she is awesome. You owe me $500. Plus whatever it will cost to get my city sticker replaced. Not to mention the time I’ll spend dealing with it. And I’m pretty sure Allstate would like to be reimbursed for the tow truck, the rental car, and all the repairs. 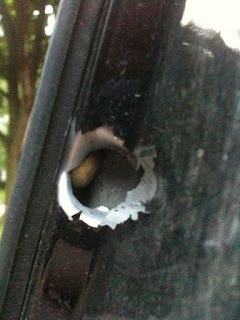 I’m guessing it isn’t going to be cheap, since you unloaded four separate bullets into my vehicle. With the glare of the morning sun, I hadn’t noticed them when I briefly inspected my car. Still thinking that – as the notice indicated – it had been an accident, I wondered what kind of flying debris or tree branches had smacked my windshield in such an odd pattern. Resigning myself to having to replace my windshield later, I trekked to the post office on foot. I thought about the car the entire time. This was the least scary looking one. It must not have been a direct hit, because it didn’t leave an actual hole, just an impact shatter. Guess it bounced off. Bullet #2: Windshield, passenger side. This is the one that made me think bullet hole as I was walking, and is also the cause of all the glass shards on the passenger seat. Bullet #3: Rear door frame, passenger side. On the left, you can see the entry hole. To the right, you can see the actual bullet still lodged in the door frame, which I found when I opened the back door to start taking my stuff out of the car. I tried valiantly, but could not get the bullet out. I wanted to keep it. Or at least hold it. I know, I’m weird. Bullet #4: Through the roof. Literally. On the left, a nice big gash in the roof. On the right, the exit wound in the interior ceiling. Interior Damage: At first I thought this was caused by the bullet that came in through the roof, but retrospectively I think the trajectory lines up with that big hole in the windshield. Regardless of its origin, one bullet went through the shoulder of the passenger seat (shown on the left) and into the rear seat cushion (to the right), where I am fairly certain it is still lodged. Oh, yeah, and as far as I know no one was hurt. Witnesses saw the shooters fleeing the scene. I called the police to see if they needed my car for evidence and the officer I talked to was really nice. He looked up the case for me, told me that two other cars had been shot, and that they had all the evidence they needed from the shell casings found on the scene. Allstate has been swift in dealing with the insurance claim. They hooked me up with a rental car within an hour of my phone call and got my car towed to their body shop for repairs. Minus the aforementioned $500 deductible, it’s all covered. My birthday. Can’t remember exactly what I made, but I do remember it was the ugliest cake ever to emerge from my kitchen. Pretty sure chocolate and strawberries were involved, but it was a sloppy mess. Green Tea Cake with Red Bean Paste filling for Alice’s birthday (which was light and delicious and really needs to be made again soon). And yes, I know her birthday is in July, but this is when we all had the same free spot in our schedules to actually get together and celebrate it. Would ordinarily be a month for making Julia’s birthday cake, but last year I made pie. Apple pie with FRESH FIGS. It was the BEST. PIE. EVER. Almost made me convert to a pie-as-dessert-of-choice girl. Almost. The cake schedule is a little lighter this year, thankfully. But Joel’s birthday came around again, as birthdays do, and so there was a Heavenly Chocolate Cake Roll (gluten-free!) with strawberries added to the whipped cream filling. And last night we threw a party to celebrate marriage equality in New York. [Yeah, I know we live in Chicago, but a journey of a thousand miles begins with a single step, or whatever, so eventually it’s gonna walk this way, right? Plus, we were raising money for LAMBDA LEGAL, and you can never go wrong with that. And, you know, we’re still not equal enough. And further more, we were celebrating in solidarity with a bunch of other people at other parties all around the country. So. A party was had. Cake was eaten. Champagne was consumed in copious amounts. Drunken neighbors crashed. But I digress, as always.] Ahem. So. Naturally, I made some Marriage Equality Cake. The purple side is Devil’s Food with Mocha Whipped Cream (are you sensing a pattern here?) and the green side is Vanilla-Almond with Apricot-Almond filling. Both were quite tasty, and I’ll be eating the leftovers all week. I’ll wait while you pencil in the date on your calendar. That’s September 18th, my place, 3ish. See you there. In short? The service was outstanding and the food was amazing. We will definitely be back to Chalkboard soon. Possibly for their Fried Chicken & All-You-Can-Drink Champagne Wednesday night special. Want to join us? I attempt to make my hair look nice by drying it in pin curls. Result? It lies even flatter than when I do nothing. I redeem myself somewhat by wearing a shirt that Julia loves, putting on a skirt (no pockets! Oh, the sacrifices I make…), and going so far as to apply lip gloss. Private Dining. It’s what happens when you make your Friday night reservation at an old lady time like 5:30pm. Yep. Finally using the toasting glasses we planned to use at our wedding. They are really, really nice. Also – heavy. Chicken Liver Pate, with Toasted Brioche and an assortment of complimentary flavors – white beans, onions, mustard, radish, olives. Watermelon Salad with grapes, crème fraîche, and some kind of little flowers. Seared Scallops with vanilla sauce and olives. Duck breast with Tzatziki sauce and fries. Hangar steak with white beans and pesto. Three-Bean Salad with Gouda (vegetarian) – I LOVED this dish. Julia was not a huge fan, but I think that was mostly because I bought smoked gouda and she does not enjoy smoked cheeses as a rule. Too bad for her. I love them. Ghetto dinner. Ok, this is no high-class meal, but sometimes? You just have to pick up whatever you can eat as soon as you get it home. So. Salad. Chicken. Forks. Wine. DONE. Grilled Basa with Chickpea Salad – Julia says she put too much garlic in it (as you do, because the amount of garlic in every recipe should always be doubled. You do that, right? ), but I thought it was awesomely garlicky. Then she made this lovely little bean salad with chickpeas, tomato, cilantro, and red onion. I wasn’t expecting it to be a cold salad, and it was really refreshing. Also just as good warmed up the next day. Potato, Spinach, and Pine Nut Gratin – I’m sure you can guess that this was delicious. I don’t think I need to say anything more about it. By the way, that little salad? Mixed greens with tomatoes, nothing fancy, but the trick is that instead of our usual dressing, she drizzled it with olive oil and cracked a bit of fresh pepper on it. So simple, so good. And then? Then there was the night she took a couple sea basses, wrapped them in Serrano ham, and stuffed them with more of the ham and garlic. Crisp, salty ham around tender bites of flaky fish? Holy crap, that was yummy. And I haven’t even told you about the vegetables. They were stir-fried with a sesame sauce and amazing on their own. Five star meal. Oh, and I almost forgot – it was followed by dessert. To be fair, I actually made it, because, you know, I am the dessert-maker. I know what’s what when it comes to custard. (Ask Keely about those Napoleons I made her that one time. 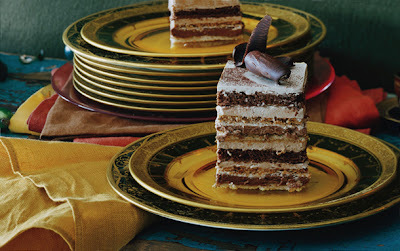 Or anyone who ate the top layer of our wedding cake.) Anyway, I digress as usual, I made Crema Fritta. Literally it translates to fried cream. But essentially, it’s custard (think flan or crème bruleé, minus the bruleé), and then it’s battered and fried. And drowned in blackberry sauce, and topped with whole berries. It was SO. GOOD. Not the prettiest thing I’ve ever made, but really really tasty. And I’ll leave you with that to drool over. If you’re wondering what I think about using mics (or not) for your wedding ceremony, you can go read all about it over on Frugally Wed.
Oops, I blinked and missed it – my guest post has been up on Sarah’s blog since Tuesday! Go check it out if you want to know what we love about Chicago. Oh, you guys, I am really trying to keep this blogging thing going, because I do enjoy it. But – when I get busy (which you know is often) it is hard for me to find the space in my brain to decide what to write about, and then get the chunk of time needed to actually write it. Some of you know I’m on vacation from yesterday through Sunday, and you might be thinking – of course she has time! And, yeah, I sort of do. The thing is, though, I think our little business is really starting to take off, and that has to be a priority. Slept in until 7:30 or 8am! Installed new operating system on my computer, and then new money software, and am currently in the midst of transferring all our data over from the old program and setting up our budget. CELEBRATE OUR ANNIVERSARY. Yeah, I know it was a month ago, and we did celebrate. But I think I mentioned we had been planning to go to a big fancy dinner only to find out that the restaurant we wanted to go to was closed. So. We rescheduled our anniversary for ‘one of those upcoming weekends when we might have some time’ (HA!) and here it is. We’ve got a reservation at Chalkboard for Friday night, and I’m hopeful we will be able to schedule some massages tomorrow or Saturday as well. Yay! And, let me say, I am NOT complaining. I love doing all these things. Not that I wouldn’t love just sitting at the beach all day, in some semblance of what I imagine normal people do on vacation – I would love that. But – the reason why we’re making this business happen is exactly because we LOVE doing these things and want to eventually do them full-time. Or at least enough of the time that we can pick and choose what shows or other work we want to do the rest of the time.